Camping season is upon us and I find that there's nothing like having a good book to curl up in the hammock with or kick back in a lawn chair with after the kids have gone to bed. Many of our car trips also tend to get a tad long and I've been blessed with the ability to read while travelling. In fact, I read 6 books on our last road trip! And then there's always the backcountry trips we plan every summer. When dinner's done, everything's quiet, and I'm not ready for bed yet, I find there's nothing more enjoyable than reading a chapter or two out of a new book. I know I'm not alone so my question to all you vacation and camping readers out there is this: What kind of book do you like to read when you are at camp, in the middle of the backcountry, or en route to a grand adventure? Me, I look for adventure themed books, bucket-list travel books, and anything that is going to inspire me on that next adventure I'll plan. The book that really got me dreaming last summer is called Up. 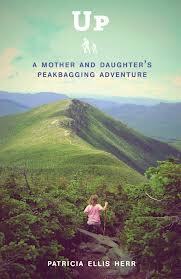 A Mother and Daughter's Peakbagging Adventure, by Patricia Ellis Herr. Not to be confused with the Pixar movie with the same name, there are no balloons used in this book to reach the summits that Patricia and her daughter Alex climbed. The Mother daughter duo climbed all 48 of the highest mountains over 4,000 feet in their native New Hampshire on their own steam. And if you think it's not a big deal to climb a bunch of 4,000ers, I should mention early on here that Alex was only 5 years old when they began the quest to summit each of these peaks. That's only a year older than my son is right now! Knowing the average preschooler and their endurance, skill with climbing, and tolerance for hiking in wind, rain, snow, thunder and lightning, I can say without a doubt that Alex is no ordinary kid - and this is definitely no ordinary book! 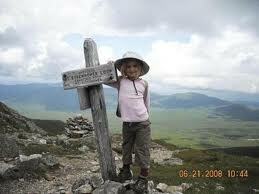 Alex would be climbing grown-up sized mountains that the average child would never be carried up let alone walk up. In Alex's mission to become one of the youngest people ever to climb all of the 4,000ers in New Hampshire she would have to summit and descend each mountain 100% on her own effort. This meant that if there was a high stream crossing for example, she could not be piggy-backed across. She had to walk across like everybody else - with the height of a 5 year old! It would take just over a year for Alex to summit all 48 peaks! A year! And did I mention that she wasn't even 7 years old when she finished? Several of the peaks would require an overnight stay en route to the summit. Add backpacking to the list of incredible things this child was now doing. And not cross-country backpacking but backpacking up a mountain. Alex did not generally hike with other children. She was always in the presence of other adults. As such, she was generally expected to act appropriately with no fits of screaming, crying, or tantruming over being too tired, hungry, thirsty, hot... - the list, as you know if you've hiked with young children, goes on. In order to tackle all of the 4,000ers, Alex would have to climb Mt. Washington as well which is 6,288 feet tall. And while there is a road to the top of Mt. Washington, Alex would have to hike the full distance over two days. If Alex's tenacity still hasn't impressed you, check out this quote I found on a website that talks about climbing Mt. Washington. Mount Washington has the reputation of being "Home of the world's worst weather". Severe storms, including snow, can happen at any time of the year. The combination of severe winds, cold and wetness can exhaust the strongest hiker. Never continue upwards in deteriorating weather, as it gets worse at higher elevations. To a person unused to mountain trails or in less than excellent physical condition, this unrelenting uphill grind can be grueling and intensely discouraging. If you are not an experienced hiker or a trained athlete, you will almost certainly enjoy the ascent of Mount Washington a great deal more if you build up to it with easier climbs in areas with less exposure to potentially severe weather. As I said, Alex was climbing Grown-Up Mountains! Alex had to gain over 1000 metres to ascend Mt. Washington. I can barely do that these days! And guaranteed my son can't. By next year he still wouldn't be able to. I'm not going to make this long because I'm hoping I've already given you enough of a teaser and intrigued you to go grab a copy of the book and read it this summer on one of your adventures. It reads very easily like a fiction book and I was able to read a chapter at a time as free moments permitted. It wasn't something I had to sit down and read all at one go. I also found the book easy to digest in small pieces because of the unique themes in each chapter. While each chapter described a summit or two, there was also a lesson included that I often needed to digest for a while before I was ready to move on to the next chapter. Some of my favourites were "I think I can" Works and Ignore the Naysayers. Always wise lessons! I can definitely tell you that by the last chapter I was bawling as I read the account of Alex summiting her final peak and felt like I knew her. I became so engrossed in the story that I felt a huge sense of sadness when I finished the book. 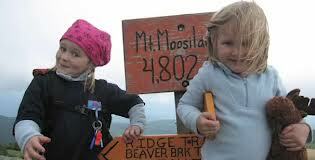 Fortunately for me, Alex's adventures are far from over and her younger sister Sage is now following in her sister's footsteps. You can buy a copy of this book at your local book store or buy it online at Amazon.ca or Amazon.com. To follow more of Patrica, Alex, and Sage's adventures as a family visit Patricia's website at Trish, Alex, and Sage. And a side note for Patricia, please bring the girls to Canada because I want to hike with your family and introduce you to some of our majestic peaks. You have a tour guide when you get here. Disclaimer: I was given a copy of this book to review but as always, all opinions and thoughts are my own. Thanks Kathy. Good catch, lol. Definitely a good read. Other good adventure books...Good question. Most of the books I've read recently have been guide books. Love love love this book. Read it a few months ago and totally inspired me!